Organic Vegetable Garden can be done on a table-top! We have set-up several small raised beds for our vegetables, herbs and spices growing all these while. However; it had never be sufficient for my gardening experiments. In mid-spring this year, the man in my house suddenly constructed a table-top garden bed for me. He said it is a compensation for my last lost spring tulips bulbs. I was so excited about it, because I had a chance to do my own garden design on a table top. Imagine... if you yet to have a chance to design a big garden; a tabletop is good enough to exercise your creativities and fantasies. So I started to layout my favourite list of vegetables right away. When you are looking at your bush of vegetables on an eye level; you can spot the insects fast and hand pick them almost immediate; before they started their damaging plans on your crops; especially they laid eggs upon your favourite plants. When you are doing your gardening on a table top; you don't have to bend low; it is much like having a closer contact to your plants; and you can hear them clear. If you put your head under and between the rows of vegetables plants and look up; you can experience quite the same feeling as when you are walking in the forest. Therefore, you will understand why the insects love to hide there. 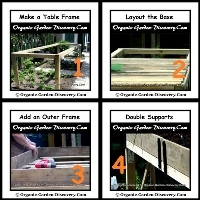 Build a four legs ordinary table frame structure; and fix them up with pieces of solid rust-free iron plates (image 1). Lay pieces of flat wood to make the base and fix them (image 2). Fix four pieces of flat wood blocks as the outer frames (image 3); and supports the four outer corners with pieces of solid rust free iron plates (image 4); and extra for the legs (image 5). 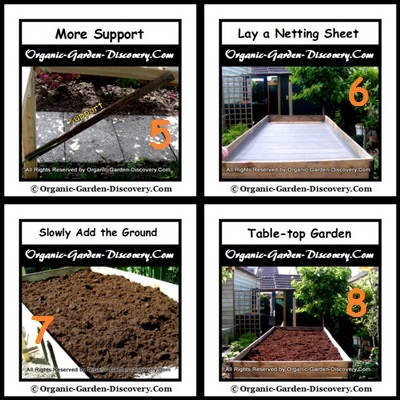 Lay a piece of net at the base before you add the soil (image 6). *You can use an anti-mosquitoes net; or a recyclable Polyethylene Screen. This way, the solid ground and worms will always remain in the bed. 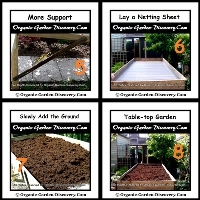 Pour in your best potting soil to fill up the table top grow box (image 7&8). *You can place a layer of rich composted dirt and ten live earth worms at the bottom before you add your best potting soil. In this way; you will have free and solid vegetable fertilizers for the whole growing season without worries. 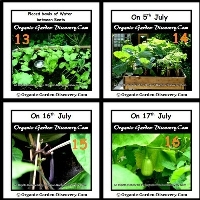 All organic garden fruits and vegetables plants (image 10 to 12) are joyfully growing slowly into sweet charms. 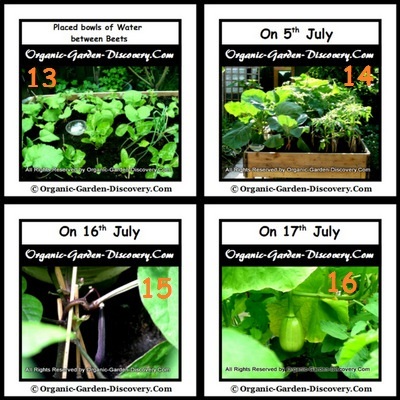 The size of our garden (image 17) is 250cm or 8 feet (Length) x 95 cm or 3 feet (Width) x 15 cm or 6 inches (Depth). If you are not interested to do it yourself; you can also buy a ready made table top set; or just place your favourite size of planting box on a weather proof table. *If your vegetable plants are heavy crops; support your table with additional legs is necessary. Otherwise; after the heavy rain falls; the center bottom of the table may sink; and the table will become unstable. *Beware of the month of heavy wind and pouring rains; make sure all plants are fully supported and safe. How many types of vegetable plants can be planted on this tabletop is depends on the size of the table. Most of the vegetables are suitable for this rich bed. I have planted two rows (image 19) of different types of tomato plants (ten each); one purple shelled bean plant; garlics; shallots; beets and radishes (image 13); carrots; and one thyme herb plant was grown in between of the tomato rows. one Cabbage; 2 zucchini plants (image 18); 3 bell peppers; and 2 Brussels Sprouts plants were sitting on the third row. I love to watch the white cabbage butterflies flying about and laying her mini green eggs on my Brussels Sprouts; and the cabbage everyday. Once I discovered her eggs in the heart of the cabbages; I would pour rain water over the head of the plant; and the eggs would fell down together with the water. Then I wiped them away. It was interesting! The two Brussels Sprouts are only for experiment. If you really want to have them for consumption; you may either grow them in a greenhouse; or protect them fully. The end of the season I had collected 3500 grams of organic tomatoes; some white radishes; some cloves of garlic; some purple shelled beans; 2 clamps of shallots; 8 green beets; 1 cabbage, 2 carrots; and 6 summer tiny squashes. When the growing season is over, you can remove the table (image 20) to free out the space again for your Autumn flowers growth. 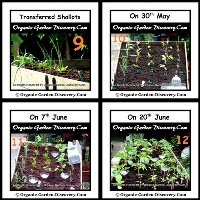 Build a worry free and no till organic vegetable garden grow bed; for all your love ones and makes every senior's dream come true? A-Z list of delighted African flowers for you to explore. You can select your favourite list of common flowers for your everydays decoration. You can find your favourite types of tulips blooming throughout the early part of the year. Christmas season is around our corner; let's cheer for all the love and joy for every person you encounter from today! 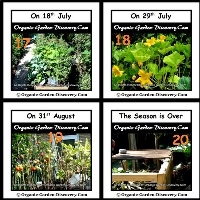 Copyright © 2008 - 2019 Organic-Garden-Discovery.Com. All Rights Reserved.